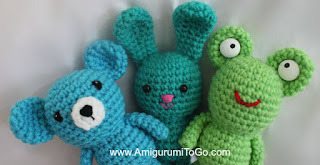 The video tutorial for these three is now on youtube. Since there's three animals in one video I listed the order the video was filmed below. I added in some key starting parts to make it easier for skipping through. The written pattern for all the parts is here. My daughter and I love your amigurumi! But the unicorn is our favourite. We saw the base pattern of it, but we wonder if we missed the rest of the unicorn pattern... We would love to make it.... Thank you for your inspiration! it's coming up. I have the fox and the unicorn left to post in this series. Thank you very much for your reply! We wait for it! Succes!! The work and energy to put in all these videos. Amazing. Thanks so much. A lot of people who don't know how to make the parts can learn it by watching your videos. Its great that you are making this easy to understand tutorials! Hey Sharon, I love all your goodies! Thank you so much for taking the time to do the patterns AND still post them for us AND make videos! I'm sure like most of your fans, we truly appreciate your hard work! I have also been dying for your unicorn as soon as I saw your "Wee Ones" post a few weeks ago. I couldn't wait, so I started making one, based exactly on your valentine heart bear (which I have also made and made a "3D" heart for his tummy,the same way you do the feet & people just love him & want me to make him for them too, but I don't know if I'm allowed to). On my unicorn and made heart shaped hooves (all 4 of a different rainbow colour, instead of round). I used your fox pattern for the ears & your monster horn for the horn. I'm busy doing the mane right now. So I'm nearly there :p My and my mom's colleagues are dying to see it! Thanks again and I will make another proper unicorn, when you've posted the pattern. Hi S... Thanks again for your dedication, we your fans really appreciate all your effort. Have I missed any updates on the little white rat I think you called it or a mouse maybe? I was able to bring bright smile to a severely disabled child who speaks little by giving her BF monkey. You bless me! I haven't done any updates on the rat. I wasn't sure if it would be a pattern, I free styled and didn't write things down. The paws would take quite a bit of explaining, so I'm not sure. It def won't be this year as my pattern/video to do list is really full. Maybe in 2016. I do love rats, might not be the exact one I made my son. We'll see what the new year brings. Thanks for your great lessons! They are very easy to understand ☺ Can you please tell me what is the material of the yarn you use? Is it from a cotton or anything else...because here we dont have red heart yarn :( Thanks in advance ☺ Have a great day! Have you uploaded the unicorn pattern because I would like to make it as a gift for someone. yes I have, a long time ago. Scroll up and look to the right for the search bar, type in "Unicorn". THANK YOU SO MUCH FOR THIS PATTERNS. AND YOUR MARVELOUS VIDEOS ON YOUTUBE. KISSES FROM BRASIL.